Living with a tiny garden? Try these tips to make the most of your space. Espalier is the art of growing trees flat along a wall or fence using a lattice or trellis, although there is also a free-standing technique you see in vineyards. It is a centuries old practice and while it is commonly used for fruit trees, you can try flowering trees as well, especially deciduous trees. According to nursery company Flemings, an espaliered apple can require as little as one metre width and 300mm depth. Apples and pears are the easiest fruit types to train because their wood is supple. Plums, peaches, nectarines and almonds also work well, as do apricots, grapes, currants and quinces. Cherries can work but only on a basic horizontal design as they aren’t as flexible. Flemings said that a sturdy paling fence is the ideal starting point. Attach a series of horizontal supporting wires, approximately 300mm apart, up to about two metres in height, with the lowest wire being about 300 to 450mm above ground level. It can be tempting to try to fill your small garden with as much greenery and colour as possible in an effort to maximise the available space. But this can be counter-productive, and creating space to breathe, such as with paving or grass patches, can be much more effective. 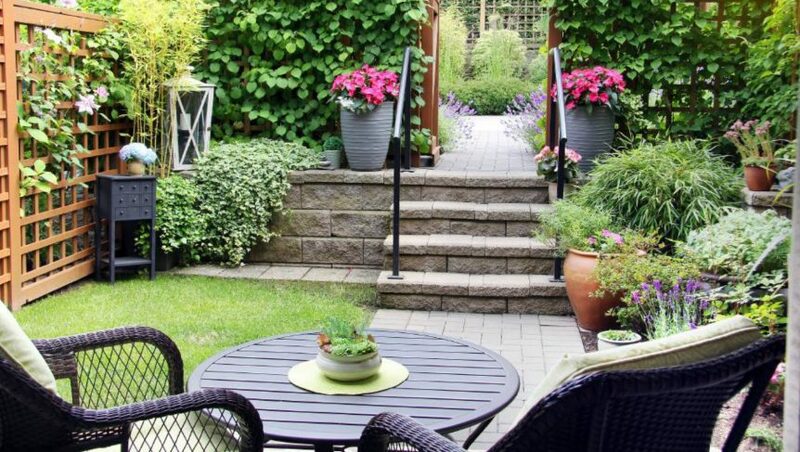 You could also create areas with a purpose, as breaking up the garden can make it appear larger. For example, use a raised garden bed for your vegetable patch, and then in the opposite corner have a relaxation area with a bench seat and cushions.